Afternoon tea is served from 4.30pm-7.30pm daily in two locations. The first location is outside in the hotels gardens where a live pianist serenades you with delightful melodies throughout your afternoon tea seating. The gardens are pleasing with large water features and bright flowers; once again in keeping with the very high standards of the hotel the area is spotless with well presented white furniture matching the colour of the hotel. The second location is inside the hotels’ lobby bar which is equally luxurious with its own charm for days when the weather is a little more reminiscent of the weather back home. As to be expected from such a distinguished hotel, afternoon tea at the Ritz Madrid is a grand affair with a well planned menu catering for a range of dietary requirements. Whilst the inspiration behind the afternoon tea menu is heavily influenced by English tradition; the menu incorporates Spanish flair into the food items within this afternoon tea. 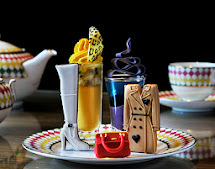 Another feature to the menu which is both enjoyable and novel is the wide array of items that you can order in addition to your afternoon tea. A popular add-on is a local treat, hot chocolate accompanied by Churros (which in essence is a Spanish style doughnut) with a pot of Valrhona chocolate for dipping. This is just one example of how the Ritz Madrid stunningly combines local food, and indeed an insight into local life within the confinements of unrivalled luxury. It is also worth noting that all of the items served within this afternoon tea (and additional on items) are fresh, alongside being sourced from the very best pick of local produce. We can personally testify this yields a truly splendid taste. In light of the above information, our levels of excitement were reaching very high levels as we began to imagine what our first afternoon tea in Spain would entail. We were guided to our table by our waiter David; whom from the onset took great delight in ensuring we really enjoyed our afternoon tea experience. Our table was perfectly presented with a crisp white table cloth, and exclusive Ritz Madrid chinaware (delicate blue flowers, with a gold rim) and silverware. As we sat down, David provided us with a little stool to avoid our bags touching the ground and proceeded to tuck us into our table before placing the napkins on our laps. Afternoon tea began with the menu being explained to us before we selected our first tea (throughout the afternoon tea we were informed you could change teas). We selected a classic ‘Jasmine’ which had a refreshing taste and ‘Diana Cazadora’ a black tea exclusive to the Ritz Madrid. We were told that the tea was first introduced by a Sultan from India who was staying at the hotel. The tea proved to be very popular with other guests and has consequently stayed on the menu ever since. Our tea was served in elegant silver tea pots, and poured for us through delicate strainers. As we sat sipping our tea, taking in the beautiful surroundings whilst the pianist melodies played in the background we could not have felt more content or relaxed. David returned within a suitable time frame with our tantalising afternoon tea, presented on a silver three tier stand. We were talked through the differing tiers before we proceeded to indulge. The lower tier consisted of finger sandwiches served on white bread with their crusts removed; the selection entailed the following cucumber and tomato, chicken, egg, salmon and ham from Extremadura. We really enjoyed this selection, and although a subject of much deliberation between us the ham sandwich was our favourite. The middle tier was filled with freshly baked scones (sultanas/plain) and plum cake accompanied with clotted cream and strawberry confiture. Once again we really enjoyed the contents of this tier, but our preference edged towards the plum cake due to intense flavour. The top tier of the afternoon tea, our favourite was adorned with delicate handmade pastries ranging from fruit tarts, mini meringue cakes and pastries filled with light cream. We are unable to determine a favourite for this tier, but can happily agree each one tasted delicious. I must also mention that throughout our afternoon tea David kept a watchful eye over us, to ensure we were enjoying our food, clean plates were provided to us between tiers and even to offer helpful suggestions such as a change from hot tea to refreshing mint iced tea. Feeling what can only be described as extremely naughty, perhaps encouraged by our lovely surroundings we decided to indulge further by exploring some of the additional items on the menu. There are three items on the menu that we really enjoyed; and think perfectly compliment the afternoon tea, or are divine enough to be enjoyed on their own. The first item is lemon macaroons with cinnamon dusted raspberries. This dessert is beautifully presented on a long white plate and comprised of four light purple macaroons with a succulent lemon filling. The macaroons are bursting with flavour and can only be described as heavenly. The second item is inspired by an exhibition devoted to the artist Salvador Dalí being held in Madrid at Museo Nacional Centro de Arte Reina Sofía. The Ritz Madrid has designed a fabulous caramel cake, with admirable attention to detail to recreate one of the artist’s most famous pieces of work ‘Melting Clocks’. The cake itself is the very essence of indulgence, with a rich taste and bursting with popping candy that yields a unique yet enjoyable experience in your mouth. Our last recommendation was our favourite, violet sorbet served in a martini glass. We were told the inspiration behind this desserts creation was based on the King of Spain Alfonso XIII. Every year of marriage, and every birth of an heir the King would give his wife a diamond flower, based on the popular Madrid based violet candy of that time. The Ritz has transformed this into a freshly made sorbet, with an enticing aroma and unmatchable taste. Our afternoon tea experience at the Ritz Madrid was a truly fabulous affair, We left feeling relaxed, very spoilt and suitably full! We think this afternoon tea would be a perfect choice for birthdays, anniversaries or like us because you are feeling rather indulgent on a Sunday afternoon. We had a magical weekend staying at the Ritz Madrid, which must be accredited to not only the beauty of the hotel and reputation but the courteous, and helpful staff under the guidance of Alvaro Marzal that really; make sure your satisfaction and happiness is maintained the entire duration of your stay.